In its current incarnation, X-O Manowar is acting as Valiant's flagship title. The character relaunched the publisher in a big way back in 2012 and has been synonymous with the name since originally being published in 1992. Such a popular and storied title deserves the star treatment in Valiant's eyes and they're pulling out all the stops for the 25th issue of the series. 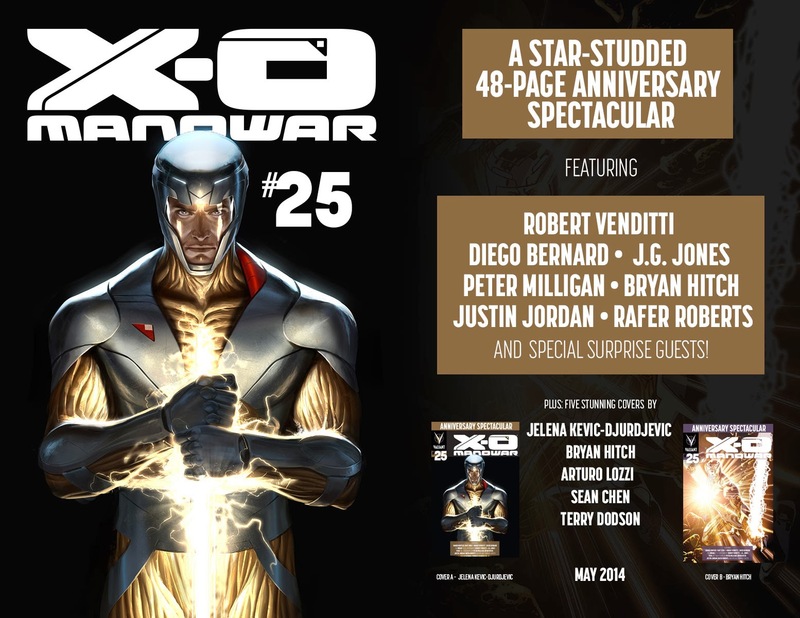 X-O Manowar #25 will get a 48-page anniversary spectacular which will include special guests such as Bryan Hitch, J.G. Jones, Justin Jordan, Peter Milligan, Rafer Roberts and more. "We're overjoyed to be celebrating our first major anniversary with X-O Manowar #25, and we're packing this issue to capacity to make sure it's the must-read milestone that this series deserves. With the Armor Hunters crossover event about to come crashing down on Aric of Dacia's world, summer 2014 is going to be the summer of X-O Manowar – and issue #25 is the perfect place to jump on board," said Valiant CEO and Chief Creative Officer Dinesh Shamdasani. Before X-O Manowar steps front and center for the Armor Hunters crossover event beginning in June, he'll be celebrating 25 chart-topping, critically acclaimed issues with a special oversized anniversary issue, bursting with all-new content from the top creators in comics today. That content includes Armor Hunters: Part Zero by Robert Venditti and Diego Bernard, The Origin of X-O Manowar by Venditti and Jones and all-new tales of X-O Manowar by Milligan, Hitch Jordan, Roberts and special surprise guests. "When X-O Manowar #1 by Robert Venditti and Cary Nord hit shelves in 2012, it didn't just mark the return of one of the greatest characters in comics – it also marked the return of Valiant," said Valiant Executive Editor Warren Simons. "Now, with our biggest story yet – Armor Hunters – just over the horizon, X-O Manowar #25 is the perfect opportunity to celebrate the incredible work that Robert, Cary, Lee Garbett, Trevor Hairsine, Stefano Gaudiano, Jelena Kevic-Djurdjevic and Diego Bernard have accomplished." Whether you've been reading X-O Manowar since issue #1 or you have yet to pick up your first issue, X-O Manowar #25 is a can't-miss comic book event celebrating the character's past and future with a spectacular array of brand new stories. The work will feature shelf covers by Jelena-Kevic Djurdjevic and Hitch and a special Armors Variant spotlighting the different incarnations of the X-O Manowar armor throughout the ages by artist Arturo Lozzi, as well as Valiant's very first throwback cover by Valiant icon Sean Chen. Additionally, there will be an iconic, fully painted variant cover by Terry Dodson – his first piece for Valiant! with ROBERT VENDITTI, BRYAN HITCH, J.G. JONES, JUSTIN JORDAN, PETER MILLIGAN and More! Valiant is proud to announce that it is pulling out all the stops for X-O Manowar #25 – the publisher's first 48-page anniversary spectacular from ongoing series creators Robert Venditti and Diego Bernard, and an all-star cast of special guests including Bryan Hitch, J.G. Jones, Justin Jordan, Peter Milligan, Rafer Roberts, and more! Plus: all-new tales of X-O Manowar by PETER MILLIGAN (X-Force), BRYAN HITCH (The Ultimates), JUSTIN JORDAN (Dead Body Road), RAFER ROBERTS (Carpool Buddies of Doom), and more special surprise guests! Whether you've been reading X-O Manowar since issue #1 or you have yet to pick up your first issue, X-O Manowar #25 is a can't-miss comic book event celebrating the character's past and future with a spectacular array of brand new stories! Featuring stunning shelf covers by JELENA-KEVIC DJURDJEVIC (Thor) and BRYAN HITCH (Age of Ultron), X-O Manowar #25 will also feature an Armors Variant spotlighting the different incarnations of the X-O Manowar armor throughout the ages by artist ARTURO LOZZI (Bloodshot); as well as Valiant's very first throwback cover by Valiant icon SEAN CHEN (Iron Man); and an iconic, fully painted variant cover by superstar artist TERRY DODSON (X-Men) – his first piece for Valiant! "X-O Manowar #1 was the first issue of a monthly comic book series that I’d ever written, so I didn't know what to expect. I hoped I’d at least make it a year, and I really hoped I’d make it two. So to be at #25 now, and to be planning far beyond, I feel very fortunate," said series writer Robert Venditti. Since debuting in the pages of X-O Manowar #1 in 1992, X-O Manowar has sold more than 8 million copies and featured work by a distinguished roster of comics luminaries including current Marvel Chief Creative Officer Joe Quesada, former Marvel Editor-in-Chief Jim Shooter, and comics legends Barry Windsor-Smith and Bob Layton. Two decades later, as the first title of Valiant's 2012 relaunch, the all-new X-O Manowar #1 by Robert Venditti and Eisner Award-winning artist Cary Nord became one of the year's highest selling debut issues, warranting four sold-out printings. In the two years since, the series has continued to accrue critical and commercial accolades, including "Best Revival of 2012" by The Onion/A.V. Club, "Best Ongoing Series" by Ain't It Cool News, and a 2012 Diamond Gem Award nomination for Best Comic Book of the Year. This May, find out why Valiant's X-O Manowar is a legend in the making, only in X-O Manowar #25 – a milestone 48-page celebration from a colossal cast of all-star talents! Written by ROBERT VENDITTI with PETER MILLIGAN, JUSTIN JORDAN, and MORE! Art by DIEGO BERNARD with J.G. JONES, BRYAN HITCH, RAFER ROBERTS and MORE!